Waterbirds and migrant waders on south coast of East Java. 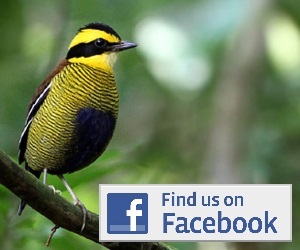 Javan Lapwing (until 1940, with local reports up until 2003-4); Australian Pratincole; Woolly-necked Stork; Pheasant-tailed Jacana; Red Avadavat; migrant shorebirds & waterbirds. This seldom visited site on the south coast of east java is most famous for being one of the last confirmed locations of Javan Lapwing. Local people continue to report birds to be present, but survey work in 2006 failed to confirm them. Apart from a chance of fame by rediscovering the lapwing, the 20 km coastal strip between Pantai Bambang and Meleman is also great for waders and waterbirds in general. 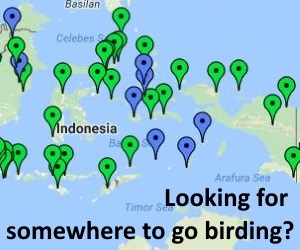 The best bet for birding the area is to base yourself in the town of Lumajang and then use a hire car or motorbike (Ojek, or hire one) to explore the coast around the villages of Pantai Bambang, Watu Pecak, Pandan Arum and Meleman. Lumajang can most easily be reached from Surabaya by bus or car/taxi (4-5 hours). Within Lumajang town there are a number of basic cheap hotels any of which would be fine for a short stay. To get from there to the coast, ask at the hotel for the car or motorbike hire options, or get an ojek (motorbike taxi). From Lumajang to the coast is only around 30 mins.